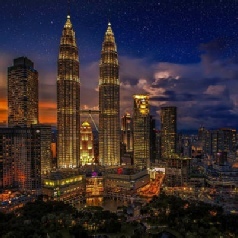 On arrival in to Kuala Lumpur you'll be met at the airport and transferred the beautiful Majestic Hotel Kuala Lumpur for a three night stay. Durations in all locations are flexible, so you can stay for as long as you wish! Your next few days are free to explore Kuala Lumpur. For local food we’d suggest making your way to Jalan Alor one evening, where dozens of stalls selling traditional Malay and Chinese dishes offer some of the tastiest - and cheapest - food around. Pick your stall, grab a table and eat with the locals! Transfer back to Kuala Lumpur airport for your onward flight to Langkawi. On arrival you’ll be met and transferred to the The Westin Langkawi Resort & Spa for a five night stay. A wide range of hotels is available and durations are flexible, so you can stay for as long as you wish. Spend the rest of your stay in Langkawi relaxing on the stunning beaches and exploring the little fishing villages. Transfer back to Langkawi airport for your onward flight to Penang. On arrival you’ll be met and transferred to the Shangri-La’s Rasa Sayang Resort & Spa for a five night stay. A wide range of hotels is available and durations are flexible, so you can stay for as long as you wish. Spend the rest of your stay in Penang relaxing on the beach, exploring the island and soaking up the atmosphere. Return transfer to Penang airport for your return flight to the UK. Special offers Prices are per person based on two sharing, including flights, transfers and accommodation, and are subject to availability.